NEW YORK Take note, tennis fans: Serena Williams looks poised for another big run at a Grand Slam. So does her sister. Serena Williams posted her easiest victory yet at this U.S. Open, showing no ill effects from a lingering thumb injury and beating No. 10 Marion Bartoli 6-3, 6-4 Sunday to reach the quarterfinals. Im definitely better than I was in my first match, she said. A few hours later, with her younger sis watching from a private box, Venus Williams kept the pressure on No. 5 Ana Ivanovic and beat the Serbian teen 6-4, 6-2. Through four rounds, the Williams sisters both two-time U.S. Open champs have won every set. That kept them on track for a family reunion in the semifinals. We have one more step, Venus said. Seeded 12th, she frustrated Ivanovic and let the 19-year-old beat herself. Ivanovic won only two points at the net and missed several more. After putting a shot into the mesh, she kicked the ball over the net and later slammed her racket. Next up, Venus will play the winner of the match between No. 3 Jelena Jankovic and No. 19 Sybille Bammer. For Serena, she gets the winner of the night match between No. 1 Justine Henin and No. 15 Dinara Safina. Rafael Nadal also won in straight sets. The second-seeded Spaniard defeated Jo-Wilfried Tsonga of France 7-6 (3), 6-2, 6-1 to make the fourth round. In other mens matches, No. 15 David Ferrer of Spain staved off one match point against No. 24 David Nalbandian of Argentina and beat the 2002 Wimbledon runner-up 6-3, 3-6, 4-6, 7-6 (5), 7-5, and No. 20 Juan Ignacio Chela of Argentina beat No. 12 Ivan Ljubicic of Croatia, 6-4, 6-7 (5), 2-6, 6-3, 6-3. At night, No. 3 Novak Djokovic was scheduled. Much stronger and faster than Bartoli, No. 8 Serena Williams fittingly finished her off with back-to-back aces. Williams had no problems with the chair umpire, either. In her last match, she got reprimanded for reading from her pink notebook during the match. Its definitely OK. Its something Ive done my whole career. I never got signals or any of that stuff, she said. Im always out there by myself and that helps me stay focused. Even though Serena Williams is an eight-time major champion, there were doubts about her going into the final Slam of the season. She sprained her left thumb at Wimbledon disabling her two-fisted backhand and had not played since, prompting some to wonder how effective shed be in this tournament. A couple of weeks ago, I wasnt even sure if Id be able to come here, she said. Then again, maybe there was an omen. While recuperating, she wore a splint that kept her hand in the same position: thumbs up. Thats how it went for Williams at the Australian Open. Hurt for much of 2006, she went into Melbourne unseeded, then reeled off a strong run to win it. She just elevates her game when she needs to, Bartoli said. If Williams plays Henin, it would be their third consecutive major quarterfinal meeting. Bartoli had a breakthrough at Wimbledon, finishing as runner-up to Venus Williams, but the Frenchwoman has struggled to duplicate that success. Physically overmatched, her best shot was to try to wear out Serena Williams with steady, deliberate returns. Using a two-handed grip from both sides, Bartoli is known for her unusual training methods her father likes to hit multicolored, multisized balls at her in practice to sharpen her focus. Williams, however, hit the same kind of ball at Bartoli all match. As in, really hard. She held a 32-10 edge in winners and her fastest serve was 124 mph to Bartolis 106. 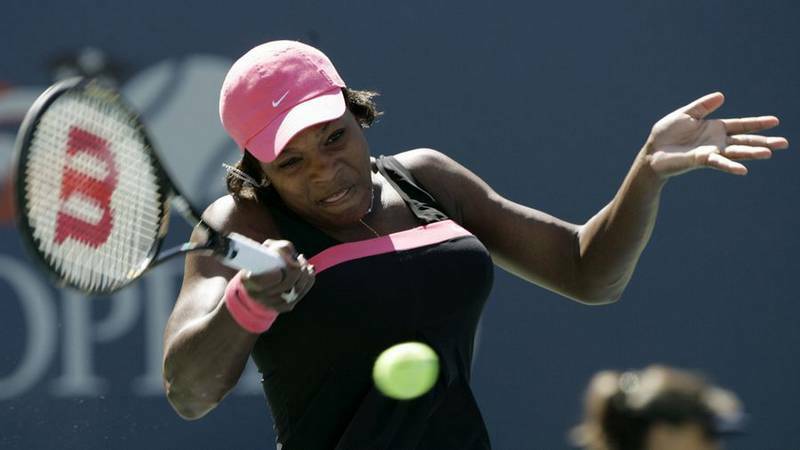 Williams also stayed in control, putting 81 percent of her first serves in play. I almost just couldnt return it, Bartoli said. Its coming so fast. The only thing slightly soft about Williams was her voice. Normally shrieking a lot on court, she took it easy.I dont know why, she said, sounding a bit hoarse. I didnt scream too much today.